Today: Don't get sour about balsamic vinegar. Learn to navigate the labels! Ever find yourself at the grocery store hoping to buy balsamic vinegar but have no idea which one to choose? It’s happened to us. Don’t panic and take shelter in the chocolate aisle. We’re here to help! First, what is balsamic vinegar? Balsamic vinegar is a reduction of unfermented grape juice (called grape must), which is cooked down and then aged. 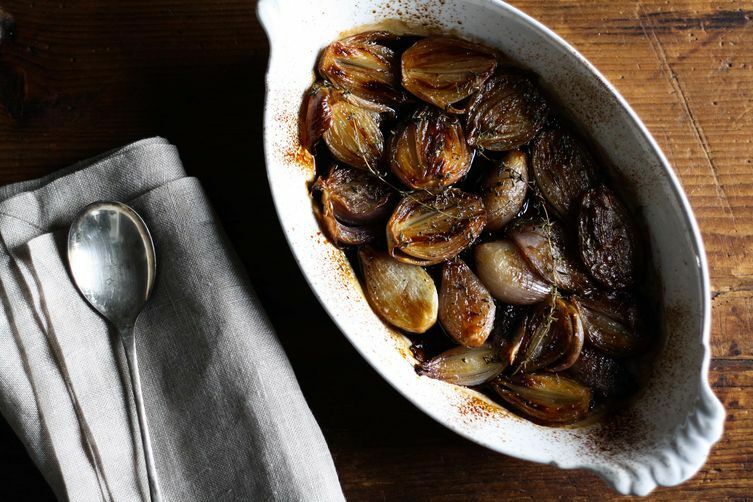 Traditional balsamic vinegar is thick enough to coat a spoon and has a delicate balance of sweet and sour. Most stores carry at least a handful of balsamic vinegars, some the real deal and others thin, acrid-tasting imitators. The problem is they all appear the same in the bottle. In order to help differentiate, the European Union created different terms to signify where and how a vinegar was made. 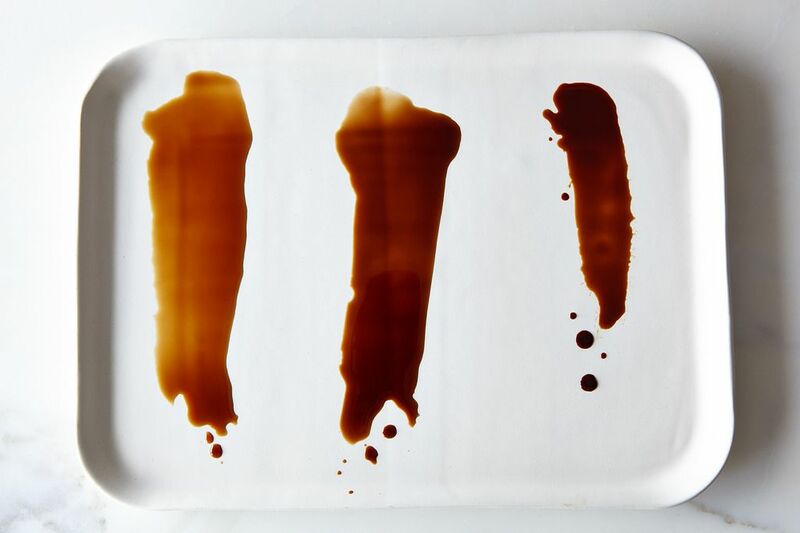 Here’s how to decode the labels: First, and most importantly, all balsamic vinegars fall into three categories: tradizionale (DOP), balsamic vinegar of Modena (IGP), or condimento grade. Generally, the more expensive the bottle, the more viscosity, complexity, and sweetness the vinegar will have. The most expensive is traditional balsamic vinegar (DOP), or aceto balsamico tradizionale. Produced only in Modena or Reggio Emilia, this vinegar has a protected designation of origin (DOP) from the European Union. These true balsamic vinegars are made from cooked grape must (made by pressing Trebbiano or Lambrusco grapes), which is then aged in barrels. To qualify as tradizionale, balsamic vinegars must be aged for a minimum of 12 years and have no ingredients other than grape must. The color of the label indicates the minimum level of aging: Red means 12 years, silver means 18 years, and gold means 25 years. Aging yields an intense sweetness with a thick, syrupy texture and a smooth finish. Depending on the type of barrels used for aging, the vinegars will have hints of oak, cherry, and other woods. Use: If you’re making a dish where balsamic is the star -- like a panna cotta topped with balsamic-macerated strawberries -- spring for the expensive bottle. You’ll taste the difference. The price is steep (a gold label vinegar can cost around $200 for a mere 3 ounces), so a high-end aged balsamic is best used after cooking as a finishing touch. Drizzle balsamic over this soup or pair it with cheese. Avoid using it in dishes with strong flavors, like spicy food or steak or fish -- it's expensive and complex-tasting and you want it to shine. The most common balsamic vinegar that can be found at most grocery stores is balsamic vinegar of Modena (IGP), often written as aceto balsamico di Modena. Look for the letters IGP on the label, which stands for “protected geographical indication,” and means that the vinegar was produced and bottled in Modena, Italy. Though not quite as rigorous as the criteria for tradizionale vinegars, this geographic designation ensures a certain, controlled standard of quality. Made from a combination of wine vinegar and grape must, the grapes in IGP vinegars can come from anywhere in the world, but must be processed and packed in Modena to earn the label. That variety in grapes yields greater diversity of flavor and texture in IGP vinegars. Tradizionale balsamic vinegars will taste very similar regardless of brand, whereas the taste of IGP vinegars can vary. A general rule of thumb is to look at the color and price -- darker vinegars will be thicker and sweeter, and pricier vinegars should be more complex and nuanced in flavor. Use: Taste your vinegar first! Most IGP vinegars will be as sour as other vinegars (like red wine or white wine), but with a touch more sweetness. Use them in cooking when they’re a prominent ingredient in the recipe -- such as in a sauce, or in a delicate dish like risotto where you’ll notice the flavor. More: Feeling overwhelmed? Take a deep breath and have some strawberry balsamic breakfast cake. 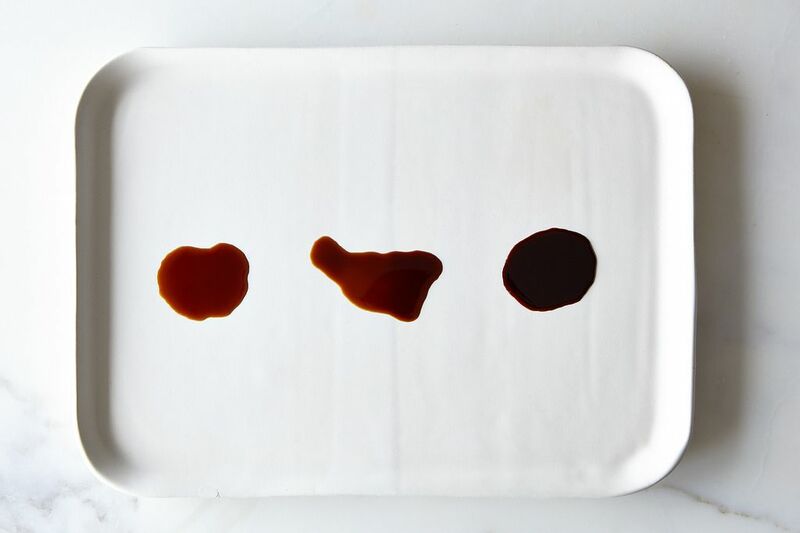 The final category -- condimento grade balsamic vinegar -- is the least tightly controlled. This term refers to all balsamic vinegars that don’t meet the IGP or DOP standards. Since the origin and production process isn’t guaranteed by the label, you’ll get a very wide range of quality. Some condimento vinegars might be excellent -- aged for years and made from cooked grape must -- and some might be wine vinegar with food coloring masquerading as Italian balsamic. Any label that says balsamic vinegar but doesn’t have the letters IGP or DOP listed is technically considered condimento grade. Check the ingredient list before you buy; cheap balsamics often have added sugar to mimic the sweetness of aged balsamic, so stick with vinegars that only list grapes or grape must. Use: Ideal for salad dressings and marinades. The flavor of these vinegars won’t be as sweet or complex, so they’re best when playing a supporting role. If you want to mimic that viscous texture of tradizionale vinegar for pouring over ice cream or dipping bruschetta, you can reduce condimento grade vinegar down in a saucepan over low heat. 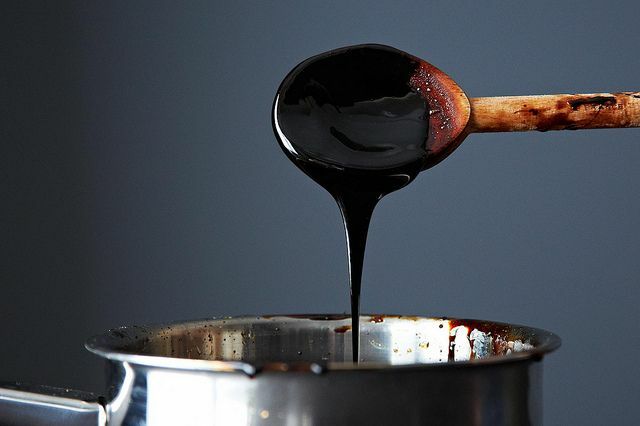 It will sweeten and thicken, so in a pinch it’s a decent trick for imitating the syrupy texture of tradizionale balsamic. 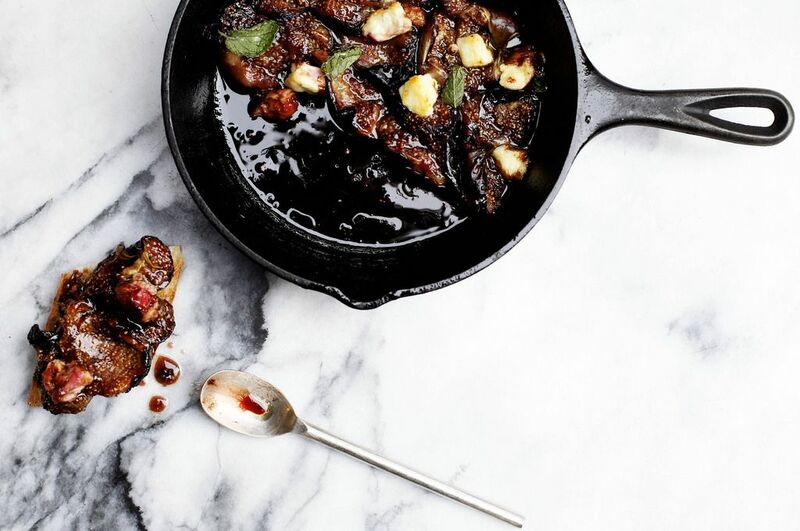 More: Master the genius recipe for sticky balsamic ribs. 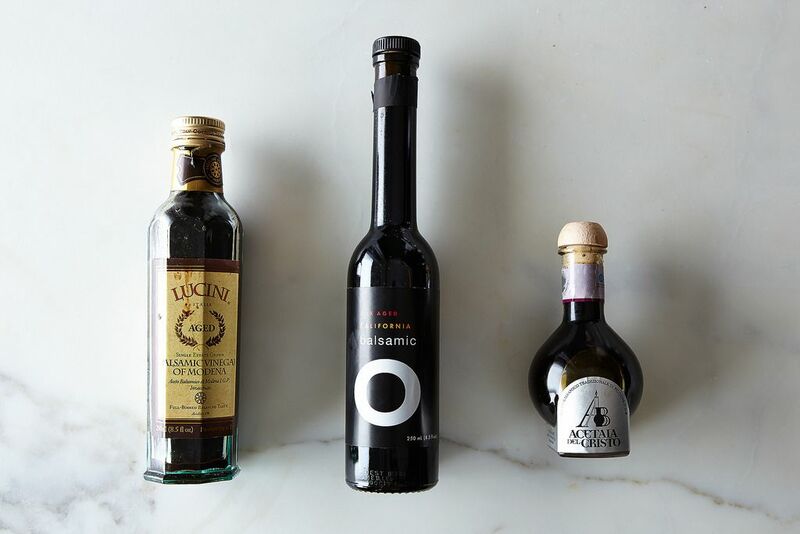 Now that you’re armed with all the right information, go out and try every type of balsamic. See which ones you like best. Make strawberry balsamic ice cream and baked figs with balsamic and feta and impress all your friends with your wicked culinary knowledge.